In RBTO’s thank you section on the CD slip, he states, “I wish to give back what wondrous blessings that have been bestowed upon me in the form of HipHop & Rap music”. Inverse features a chilled melodic edge, great flow and simplistic, and laid-back beats that I feel define what RBTO wants to give back. What’s key about the album is his ability to almost completely ostracize clichés – fame, money, women, the smoke, parties. Lyrics are definitely the seduction in this case – “And even in the silence//You can hear the tension//Twisting its grip around its invention//Tied to fear, controlled by imaginary puppeteers//”, the inclusion of personification alludes to a very poetic style of writing. RBTO is extremely ambitious. His inclusion of not one, not two, but five featuring artists really compliment what tone and sound he tries to create in each track. ‘Move On’ consists of a nice, raw, consistent old school 90’s vibe throughout – the layering of effects, little glowing specks of courtesy that spark each beat and lyric serve to circulate the undeniable flow in the chorus. In ‘Sometimes (First Cut)’ (Track 4), June’s awkward yet soulful vocals are a great asset to the ambitious experimentation here. 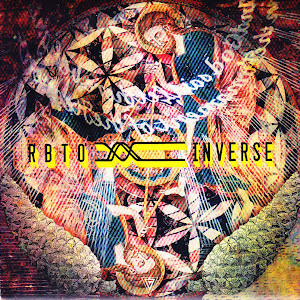 There isn’t an overwhelming amount of experimentation in this album, however on the scale I believe it manages a solid pass – the radio effect transgresses into an clean, ambient groove, however it’s almost like RBTO is featured on Marieezy’s song – RBTO contributes for just about a minute. Another track that needs to be complimented is ‘Galactica’ (Track 8). Boasting (a majority) of beautiful lyrics – “Leaving on the streets only memories of truth//Kinaesthetically infused with the energies of youth”against a flawless beat full of all the right sounds. Lastly, ‘Twilight on the Sea’ flirts with soul-snaring, laid back beats. It’s triumphal opening verse is composed of heavy bass drum, finger picking guitar and orchestral/film-like elements. The rap sounds slightly more angry and emotive, maybe even harsh. Pros of Inverse? Safe and done to perfection. Each track is relatively unique and the feature of several different artists is enhancive. The soulful, grooving ambience shows off the versatility. Cons of Inverse? A slightly hermetic feel when there are times of monotony and extremely basic hooks that might catch a sardine or two, and leaves the big fish for other hip hop artists to catch. The “wow” factor for me right now is the easy-listening factor that RBTO’s creations possess, I feel like he could go further – it all seems pretty safe – nothing is damaged, but nothing is raised.